Gnomes are diminutive supernatural creatures of a magical nature who appear to be male yet are technically asexual. They’re usually no taller than 2 feet tall with a slender to medium build. However a few hulks have been known to push 3 feet tall. Gnomes who are at least one century old often have a small beer belly and a white beard. Younger gnomes might not sport a beard and tend to be slimmer. They can look deceptively friendly, and cute. This is especially true due to their small size. They can even freeze in position appearing to be a lawn, or garden gnomes. However their true colors show when their ill will is displayed within their sinister demonic like appearance! This can include bloodshot eyes with slightly glowing crimson pupils, and vampire like fangs. All Gnomes almost always wear a tall red hat which is pointed at the top. The pointy hat has magical origins, and acts as a paranormal mechanism to focus their mischievous power. All Gnomes have bright white hair that is sought after in a variety of magical potions and spells. In addition they often leave a minty smoky smell in their wake due to the mystical peppermint clover they pack their pipes with as they puff away with glee. The mint aroma is a great way to track the little devils. It can also be used to track, and trap them! A Gnomes diet mainly consists of Magical Toadstool which they grow along with their precious mint clover deep in the forest. Unfortunately every 13 years they have uncontrollable cravings to consume human children under 5! Yes you read that right! Children under five! Young children have a unique magical innocence, or a special kind of metaphysical energy, that increases a Gnomes life by 13 years. Theoretically a Gnome could be immortal if it’s able to consume a small child every 13 years or less. It’s been estimated that missing kids are the horrifying victims of Gnomes 4.6% of the time! Due to the Gnomes small size they first render their victims unconscious by biting them. This infects a person with a supernatural sleep agent. In the case of children it knocks them out instantly. Although they are quite strong, speedy, and agile! Once a Gnome incapacitates a person they can drag them off to their hidden home in the woods before consumption takes place. If an adult stands in their way, and the child escapes it’s not unusual for them to eat said adult to temporarily cease their cravings! Since Gnomes dwell within dense forests and woodlands, we suggest supervising your children in such areas for their own safety! Playgrounds, and beaches on the edge of wooded areas should be a cause of concern for parents. It’s always wise to stay in sunlight since Gnomes shy away from the bright holy rays. This is why cloudy days always see an increase in Gnome activity outside of forested areas. Gnomes are magically evolved from the Elf line of supernatural beings. They are most closely related to Goblins, and Clurichauns (Anti-Leprechauns). Young Gnomes are solitary creatures who loath the company of others and do not reproduce. However in their later years they begin to panic at the thought of death, and will join in a Gnome group to hunt kids. New Gnomes are born from the corpse of dead Gnomes who ate a toadstool at least 4-5 hours before death and whose red hat is still on it’s head. The hat has magical properties which are passed down through the generations and give each user the memories of all Gnomes who wore it. So when a new Gnome is born he has all the knowledge of the world and his species. 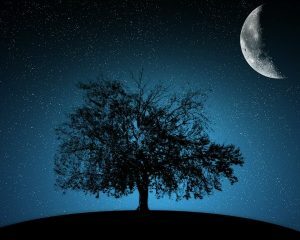 In other words each successive generation is more cunning, and more dangerous to the human world! They are born as adults and have no childhood. They start out at about 1 foot tall and grow to their maximum height within three years. Seasoned Gnome Hunters know to completely burn the corpse or simply remove the hat to prevent any further Gnome spawn! Gnomes are easily scared away by loud noises and are usually fearful of large adult humans unless deeply angered. Although they will scurry and lurk about causing mischief,and mayhem to anyone they can out of sheer evil enjoyment. They’ve even been known to brazenly harass other supernatural beings such as vampires who crave Gnome blood for it’s solar protective properties. When engaging in their blasphemous behavior you can hear their trademark snide screeching maniacal laugh. They are also spooked by lawn or garden gnomes which act as a supernatural scarecrow of sorts to ward them off. 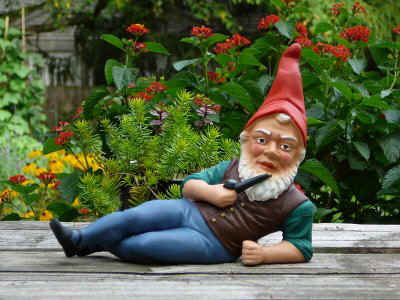 However the lawn or garden Gnome doesn’t work on a rare sub-breed of Gnome called the Garden Gnome. They are much smaller and feed off vegetables in human gardens. They’re generally harmless unless provoked and can become mischievous when gathering in groups. Garden Gnomes keep the regular evil Gnomes away due some unknown magical quality. Their bites are harmless, and it’s said they live for 1000 years! It’s thought nature Goddesses are responsible for this friendlier sub-breed. 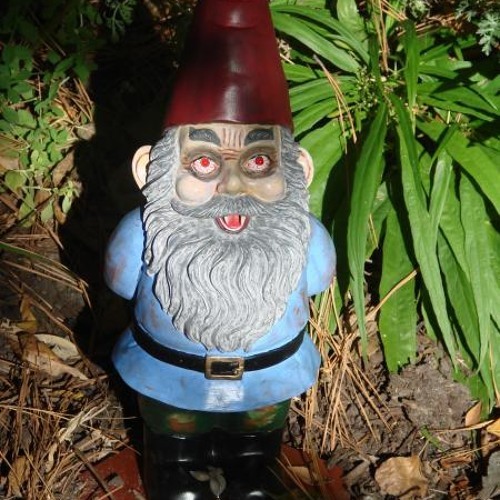 Since Gnomes are related to Clurichauns they have enough demonic lineage in them to be affected by the global curse that keeps vampires out of homes without an invite. Unfortunately merely leaving your door, or window open is enough of an invite for a wandering wayward Gnome! One of the most common calls for help here at Mystic Investigations are people who have Gnomes trapped in their attics or basements! Thankfully that demonic element allows religious artifacts to act as a minor repellent. Certainly enough to make an escape if overrun by a Gnome horde! If you spot a Gnome do not corner it since it will definitely bite or scratch you with it’s sharp fingernails! A Gnome bite of a child merely caused them to temporarily lose consciousness. However for those without the innocence of childhood a supernatural Gnome virus will cause classic flu like symptoms along with ever increasing hallucinations! This high fever Gnome Flu will eventually lead to death if left untreated. Please visit your nearest paranormal practitioner or wondrous witch for proper treatment! We suggest you grab all children and run for your collective lives if you see a pointy red hat weaving among the foliage nearby! Specially chosen Gnomes of particularly evil distinction act as Elves for Santa Claus’s wayward twin brother the Anti-Claus. Although Halloween sees the greatest general increase in Gnome activity, due to trick-o-treaters, there can be larger hordes in isolated areas the Dark Claus has visited. In essence supernatural sycophants clamoring to get the Dark Claus’s attention. The most famous Gnome is the former Commander of his Gnomes. The infamous Grinch! On the other side of the coin there is one Gnome who defected from the Anti-Claus’s terrifying troop, and joined up with Santa’s Elves after proving he saw the light. His name is Orbenheimer, and he walks about North Pole City with a long pointy green hat weaved by Mrs.Claus herself. He mainly acts as a tour guide for visitors but he’s also instrumental in providing insider Intel about the Dark Claus! Authenticated Gnome Attack Caught On Camera!